My scrap challenge project is done! Whew, just in time! When Rachel announced the challenge I took a look at that fabric stack and envisioned something very patchwork-y combined with linen...maybe a curtain or a pillow. In the end the pillow won out. We only have two windows with curtains in our house since we live on a wooded and somewhat private lot. Neither of these spots get much natural light, so I knew getting quality photos would be a problem. Sometimes, you gotta think logistics. 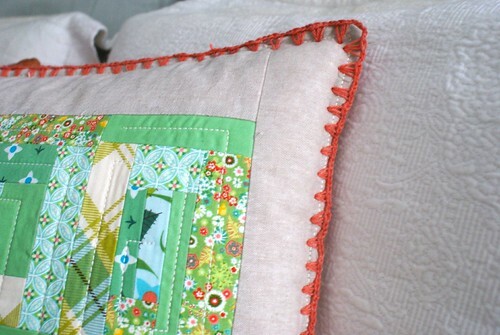 On the other hand, our bedroom needed a new fresh pillow and these fabrics paired perfectly! 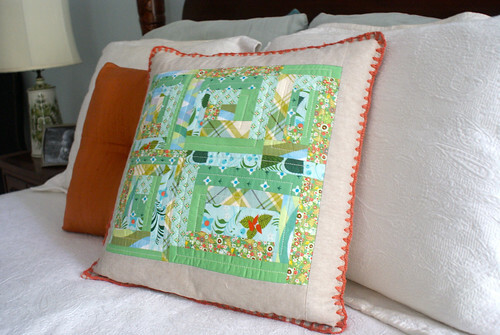 For the front of the pillow, I assembled five random log cabin blocks of different size and orientation. I quilted the blocks with a spiral design to emphasize the shape of each one. I used the triple stitch on my machine for this...an idea, which coincidentally, I picked up from Rachel's blog. I have used this stitch quite a bit (particularly on clothing) and love the effect it gives. I framed the patchwork with a border of yarn-dyed Essex linen in flax. I have talked before about how fabulous and soft this linen is - love it! When I finished the front I still had a nice amount of scraps left so I opted to do another quilted design on the back. 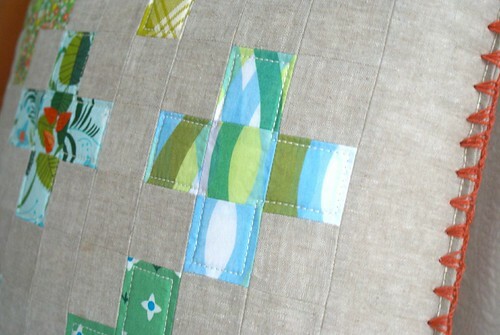 This time I cut the scraps and some of the linen into 2" squares and arranged them in a patchwork plus sign design. 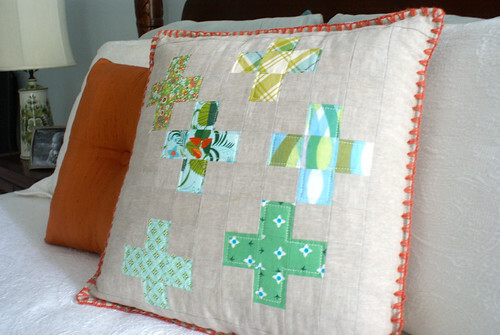 This side of the pillow is like the alter ego to the front, showing off each of the different prints. Here I simply quilted just inside the seam of the plus signs, again using a triple stitch. Now, let's talk about the edging on this pillow. This was the detail that came to me in the middle of the night when I couldn't sleep. A while back I pinned this crochet-edged blanket from The Purl Bee. I looked through the tutorial and thought it was something I could handle even though I don't actually crochet. I thought these fabrics paired with the linen had a bit of a vintage look to them and some type of crochet edging would fit well. So, I decided to give it a go. I practiced with the linen and some yarn before the scraps even arrived and it worked well. I knew wanted to highlight that orange-y red tone and found the perfect match at my local yarn store. It seemed it was meant to be. In the interest of being real, this part of my project was *almost* the straw that broke the camel's back. The first night I sat down to do the crocheting, things moved slooooowly, and somewhat painfully. Think lots of grunting and ugh-ing, cramped hands and sore fingers. I had trouble making holes, finding the holes once I made them (seriously, the linen weave is so forgiving, the holes just disappear), and my yarn kept splitting. But, I persevered, and as is often the case, it got easier and I think my technique improved. Perhaps it might have helped if I knew how to crochet as well! I guess a challenge isn't a challenge unless it's a challenge, right? 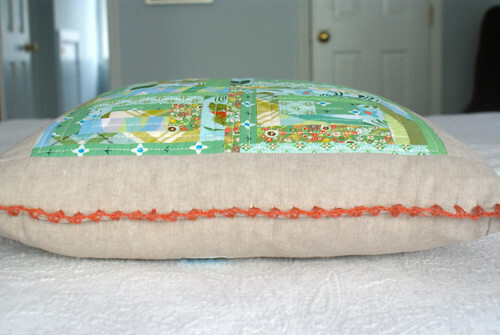 In the end, I love how my pillow turned out! It fits perfectly in our room. 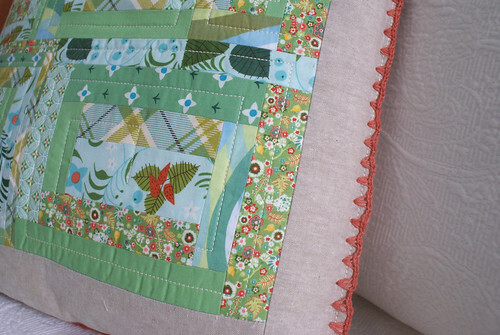 It's amazing what can be done with such a small bundle of fabrics. I think Jess over at Bloomerie Fabrics is brilliant for putting together and selling these little fat sixteenth bundles. I just might be popping over there for another set one of these days. 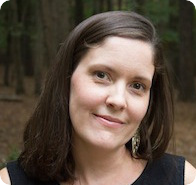 Thanks again Rachel for hosting this challenge and having me participate. I look forward to seeing what everyone makes! I love the colors you used, and the crochet edging is perfect. 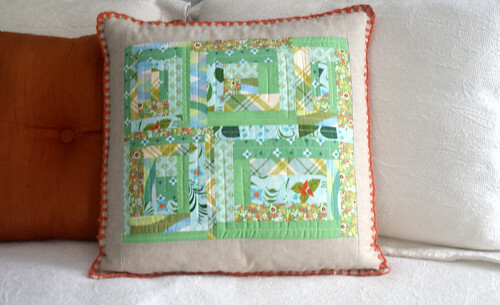 I pinned that blanket too and keep thinking I need one :) Beautiful job! Visiting from flickr. These pillows are gorgeous!! The crochet edging makes a beautiful finishing touch! Well done! How nice! I love that trim. All I can say is wow! The pillow turned out beautifully. Amazing what you can do with a little bit a fabric and a whole lot of skill and imagination. We're so thrilled to see what you did! Thanks so much for taking on the challenge!